On September 20th 2016, BOMA Canada (Building Owners and Managers Association) hosted their annual National Conference & Exhibition at the Delta Hotel in Regina, Saskatchewan. This widely renowned conference showcases and celebrates outstanding achievements and future trends in the building and construction industry. As an advocate for community health and development, it was only fitting that BOMEX reached out to us at CITE360studio to design a display that would simultaneously benefit the community. This year we decided to showcase the BOMEX “Crowning Achievements” logo in the form of stacked soup cans which were later donated to the Regina Food Bank. 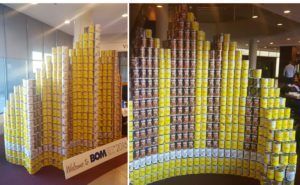 A total of 2,187 cans were used to construct the BOMEX crown logo and, with some helping hands at PCL Construction, the 8’ high structure was set in place. The logo stood not only as a marker for the entrance to the conference event but a reminder to keep the health of our communities in mind. If you are interested in attending this year’s event, BOMEX 2017 will be held in Toronto, Ontario on September 27-28, 2017. If you’d like to support our local Food Bank, cash donations or perishables are always welcome. Cash donations make the biggest difference, as the Food Bank is then able to purchase specific fresh produce and wholesale food items that are in greatest demand, ensuring your donation goes even further. For $75 the Food Bank can provide a family with a holiday meal as well as an entire week of food security, so every dollar counts!